When we say eye makeup, we aren’t just talking about the eyes but the eyebrows and everything around! If you have light or thin eyebrows, choose a shade darker than your natural hair colour to fill up your brows and give it a good shape. You eyelids, however, need a neutral shade in order to be highlighted perfectly. When it comes to eyeliners, stick to basics. Another great way to highlight your eyes is to curl your lashes and use mascara to lengthen them. However, steer clear of false lashes and heavily trendy makeup. Too many coats of mascara too is sure to spoil your look. One thing you must make sure never to do as a bride is trying on the currently trending makeup style and we stress on this all the more so that you don’t cringe when you take a look at your wedding album a few years down the line when the makeup trend is sure to have changed. The only thing we’d suggest for your face is to go with the classic look, with a sheen of bronze powder and stay as natural as you possibly can when choosing the shades. Make sure you use a bright yet elegant shade of lipstick with the use of a lip brush to get a nice little pout to form. Once the shade graces your lips you can add on a liner that beautifully compliments the shade of the lipstick. Keep in mind that following the lip line that you are naturally blessed with can help define your lips much better than enhancing it further. 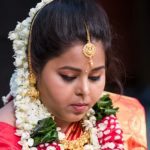 Even while applying makeup, keeping it as natural as you can will go a long way in allowing the makeup to remain intact through the wedding ceremony. One thing to actively avoid is using a neutral shade which are sure to make you look haggard and pale. The day you have been dreaming of ever since a child is finally here, bringing the chance to look your most beautiful for the occasion. You wedding is surely the one moment in your life that you would wish to cherish for ages to come with hundreds of pictures capturing all the wonderful moments you spent looking your brightest. At a typical Maharashtrian wedding, your bridal glow is enough to radiate the happiness you are feeling, adding to your innate beauty. 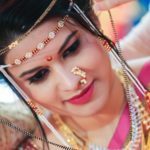 Be it an airbrushed look that you are hoping for or a simple makeup that brings out your brightness in your eyes and the glow on your face, you need not hesitate to give your opinion on how you envision yourself walking down the aisle. If you are used to a particular kind of look, try and accept a change in the way you look if your make-up artists suggests a different shade than you are comfortable with. If you don’t like it even after you have tried it, you can always say no! Most brides avoid eating or sipping water to keep their make-up intact. Don’t be one of them. Keep all these worries at bay while having someone do a basic touch-up every now and then if needed. No matter how nervous you’re feeling, make sure you enjoy your day as much as you can with the ones you love as you begin a journey with the one you’re destined for.